Everyone may already know the story of how Jesus was humbly born in a manger, but Refuge is a lyrical depiction of what came next: the new family's travels through the desert, fleeing Herod's soldiers in order to find a safe place to welcome their son into the world. 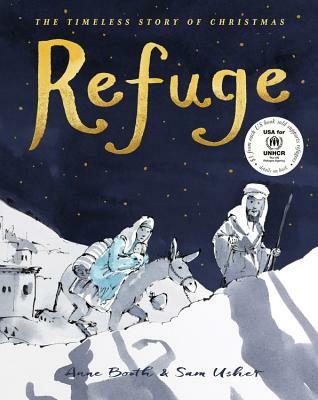 A poetic and refreshing look at the classic Christmas story that's never been more relevant, Refuge asks readers to consider the modern day implications of being forced to flee your home country. Anne Booth wrote Refuge to raise money for children fleeing war and conflict today. Her debut novel, Girl with a White Dog, was shortlisted for the Waterstones Prize. She lives in Kent, England. Sam's debut picture book Can You See Sassoon? was shortlisted for the Waterstones Prize and the Red House Children's Book Award. He lives in London.